Punk and protest are old friends. In keeping with that tradition, members of the St. Louis music community have organized a concert this Sunday, August 31, with the proceeds going toward two organizations: Missourians Organizing for Reform & Empowerment and the Organization for Black Struggle. The benefit show, hosted by the Ready Room (4195 Manchester Avenue), features nearly twenty acts in a six-hour span -- a power run of regional music in solidarity with the daily struggles of protestors made more evident by the recent events in Ferguson. "I have a lot of good friends who are really concerned with what's happening, and they couldn't figure out how to contribute or help. I wanted to give other people the opportunity to help the cause in some way. I just happen to know a lot of really good musicians," says Joseph Sulier of Life Like. Sulier might be better known for his voice in many local punk bands over the last decade, but this week he works as a community organizer. Last Friday he reached out to many local artists and built a diverse lineup that reflects not only punk, but a huge variety of genres. With acts like Blood Shaman and No Class traveling from Kansas City to perform, Sulier hopes the lineup will attract a wide range of concertgoers. The show will feature limited-edition releases from the punk community, such as St. Louis ex-pat Mark Plant's Military Police, among other unannounced surprises. "You shouldn't have to pay a penalty for standing up for your rights," Sulier adds, speaking on the struggles and confrontations that protesters have had with police. This belief is the impetus behind choosing MORE's Legal Defense Fund for Justice for Mike Brown, which was set up to support those who were arrested for protesting in recent weeks. And although Sulier ultimately organized the lineup for the event, he did so with the help of local activist Stephen Houldsworth. Video playlist of "Bands Up, Don't Shoot arranged by Graham Matthews. "One of the things we wanted to do was donate to local organizations that work on issues of institutional and structural racism. We were thinking about who is going to continue to deal with the struggle, with the underlying problem. Neither organization was created just in response to this situation," Houldsworth says. Although Houldsworth has been involved in a number of protests around the city, he and Sulier actually connected over Facebook. The two were up late watching the live streams and ended up discussing ways they could contribute. "Some people will be there because they think it's a good cause, but some people have been significantly affected and want to pour their energy into something. This is just another way to show support for a community in need," Houldsworth adds. 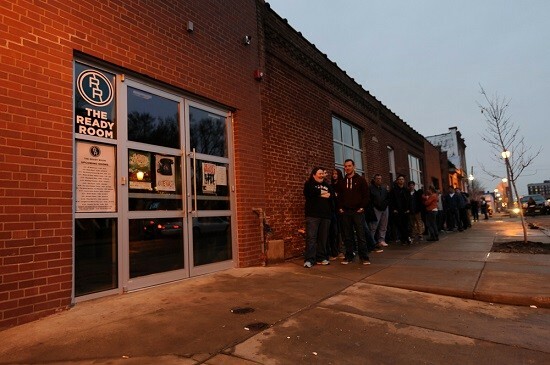 On Sunday the Ready Room's doors will open at 4:30 p.m. Music will start at 5 p.m. and because of the extensive lineup, sets will run no longer than twenty minutes. The entire concert is expected to be finished by 10:30 p.m., and both Houldsworth and Sulier assure us that everything will be adhering strictly to schedule. Tickets are available for $5 via Ticketfly. If you cannot attend, donations can be made by purchasing tickets to the show or donating directly to MORE or OBS.